The Hamilton to Strathaven line was authorised in 1857 and the man behind the idea was William Smith Dixon, the great ironmaster. The line was to leave the Caledonian Hamilton branch at Strathaven junction and run by High Blantyre, Meikle Earnock, Quarter Road and Glassford to Strathaven. The line was opened for goods as far as Quarter on 9th August 1860 with the Caledonian as the working company. The goods service was extended to Strathaven on 16th June 1862 and opened for passenger traffic on 2nd February 1863. In 1864 the H & S. was absorbed into the Caledonian Railway. 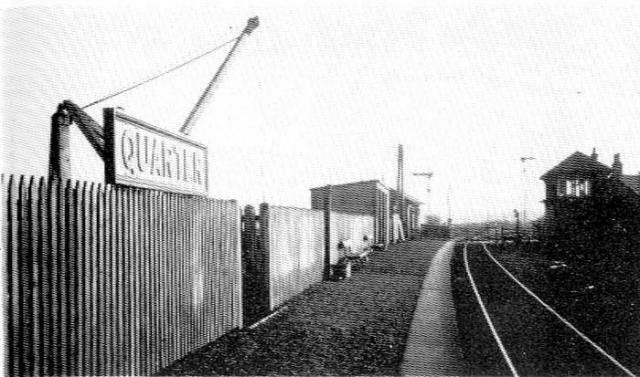 On the 1st July 1909 the station name was changed from Quarter Road to just Quarter. In 1923 the LMS Railway took over from the Caledonian and in 1945 passenger services were withdrawn from 1st October. All the pits in the area between High Blantyre and Strathaven had been closed and all workings between these points were withdrawn on 21st September 1953 with the track being removed in 1959. From the Hamilton Advertiser of 30th December 1899. On Saturday afternoon the most serious railway accident that ever occurred in the Hamilton District took place outside Quarter Road Station on the Strathaven branch line of the Caledonian Railway. Three people were killed and over twelve seriously injured. The train was the 3.15 p.m. from Strathaven, due at Glasgow an hour later and was made up of seven carriages. The accident occurred a little distance out of Quarter Station on the Glassford side, where the line passed through a single arch stone bridge. About a hundred yards from the bridge several carriages were derailed and the impact against the bridge must have been great. In two places considerable portions of masonry had been displaced, while on the sides and along the arch of the bridge, fragments of the carriages were firmly embedded in the stonework. Two coaches in particular were literally smashed to splinters. Others that passed under the bridge were thrown well up on the embankment and were also badly smashed, with some of the wheels torn off. Although partly derailed the engine and front carriage went on for fully two hundred yards before being brought to a standstill, but this distance of line was tortuously twisted and damaged. The branch line from Hamilton to Strathaven is over a dozen miles long, though the distance as the crow flies is much shorter owing to the fact that the railway makes a long detour by way of High Blantyre. As far as Quarter Road Station, which is within about five miles of Strathaven, the line is double, that being necessary owing to the heavy coal traffic, but from that point on there is only single line of rails, though the cuttings, embankments and bridges are made with a view to probable doubling of the line. From Strathaven Station the gradient is upward until near Glassford Station and then more or less sharply downward, practically all the way to High Blantyre. At the point where the accident happened the decline is 1 in 64. The line in passing through the fields of Burnbrae Farm enters a cutting, which near its deepest part is spanned by a substantial stone bridge just high enough to allow the trains to pass through. As already indicated it is more than usually wide, being designed ultimately for two pairs of rails. Coming from Strathaven the train, as it takes the cutting, enters upon an elongated S curve, a bend to the right, then through the bridge and sharply round to the left. The train was drawn by engine No 166 which is of the type with small tender and no bogey wheels, used for suburban and local traffic on hilly routes and the carriages were all bogeys except the fourth and seventh, which were six wheelers. The train consisted of two portions, the first three vehicles bound for Hamilton and the others for Glasgow. The two sections would have been separated at High Blantyre. All the plant was of modern type and in the best of condition. Apparently the train left Strathaven near the schedule time of 3.15 at 3.28 p.m., it was about five miles on its journey and reduced to a wreck. How the accident was caused is yet largely a matter of speculation. What is known with certainty from the condition of the permanent way is that something went wrong just as the train entered upon the curving decline at Burnbrae. One of the carriages, the second from the engine, it was afterwards ascertained, evidently jumped the rails at that point and rushed along out of alignment with the rest of the train, forcing metals and sleepers out of position. At first the displacement was only a few inches to the right, but it gradually increased until at the bridge about 100 yards distant, the displacement to the right amounted to about three feet. Probably a second vehicle left the rails soon after the first; at any rate, one carriage seems to have struck the arch of the bridge near the right side and another evidently collided with the masonry on the left. The impact hastened, if it did not actually cause, the disaster. As soon as the train came to a stand, those of the passengers who had escaped rendered every assistance in extricating those who were buried in the debris. In the meantime medical aid was wired for, from Quarter Station and in a comparatively short time the following doctors were at the scene of the disaster: - Drs. R. H. and J. R. Watson, Adam, Crawford, Steele and Wight of Hamilton; Mason, Dougal, Watt and Petrie of Strathaven; and Watson of Langside, Glasgow, who was visiting Strathaven, immediately driving to Quarter on learning of the accident. Later on Dr. Murray of Hillhead who accompanied Mr. Currer, the superintendent of the line, was also in attendance. John Miller Wilson Jackson aged 37 of West Quarter House, Glassford. He was a JP for Lanarkshire and proprietor of Hall hill and Tarbrax. He was unmarried and resided at Edinburgh. He was out on a business visit with Mr. Watson, engineer, Cadzow Colliery who had his leg broken and was returning to Edinburgh. Mrs. Brownlie aged 63, widow of James Brownlie, butcher, Bilbao Street, Strathaven. She was on her way to Hamilton to spend Christmas with her daughter, wife of Mr. Nicholson, grocer, Low Waters, Hamilton. William Swanson aged 35, guard, of 1 Flemington Street, Strathaven. His wife and two children were in the train and escaped unhurt. Agnes Andrew about 20, residing with her parents in Waterside Street, Strathaven - Fracture of the skull and of a leg; conveyed to Glasgow Royal Infirmary in ambulance. Mrs. Edminston about 50, wife of a farm servant residing at 21 Castle Street, Strathaven, bruised about the back and suffering from shock; conveyed to Glasgow Royal Infirmary by ambulance. Andrew Watson, mining engineer, Cadzow, residing at 10 Kew Terrace, Kelvinside, Glasgow. - Fracture of left leg and shock; conveyed to Glasgow by special train. Haddow Patterson aged 23, tailor of Balgreen, Strathaven. - Sprained ankle and shock. Samuel Hyslop aged 28 tailor, residing at Balgreen, Strathaven. - Bruise on leg and shock. Marion Stewart aged 24, residing at 38 Waterside Street, Strathaven. - Suffering from shock. James Turner aged 57, mason, residing at 10 Union Street, Hamilton. - Bruises on back, fractured ribs and shock. John Train aged 40, labourer, of 21 Barrack Street, Hamilton. - Bruises on head and legs also shock. William McSporran aged 53, miner, of Todshill Street, Strathaven. - Bruises on back also shock. James Grainger aged 26, coachman, of 11 North Street, Strathaven. - Injured about face and head. Gavin Nairn aged 47, labourer, of Limekilnburn. - Fractured collarbone, assisted home by friends. James Grant, Sandford, Strathaven. - Severe bruises and shock. Robert Glance, postman, of Chapelton - Wounded on scalp and face and fingers cut. Before the arrival of the medical gentlemen, about twenty minutes to five, the injured and dead had all been extricated and removed to the station waiting room and the stationmaster's house, on ambulance stretchers sent from Quarter Colliery by Mr. Munro, the manager. It was dark before the bodies of Mr. Jackson and the guard Swanson were removed. Both were completely hidden in the wreckage. Mr. Jackson had been all but decapitated and Swanson's body had been so terribly crushed that scarcely a bone remained unbroken. A pathetic incident in connection with Swanson's death was that his wife was a passenger in the train from Strathaven to Hamilton. She was among the uninjured and she waited in painful distraction while the wreckage was being searched in the flicker of the wood fires. On learning the fate of her husband she swooned and had to be assisted from the scene. By shortly after five o'clock as many as ten doctors had arrived and the injured had thus ample medical assistance and among those who gave kindly attention was Rev George Blair of Quarter. On the advice of the doctors, the young woman Agnes Andrew and Mrs. Edmiston, both from Strathaven, were sent to Glasgow Royal Infirmary in the Hamilton ambulance wagon. They also advised that Mr. Andrew Watson should be sent to Glasgow Royal Infirmary but he insisted upon being taken home to Kew Terrace, Glasgow and he was dispatched by special train, Dr Crawford accompanying him. Ambulance wagons were also present from Motherwell and Bothwell and they were utilised for conveying the injured to their homes. News of the disaster spread with wonderful rapidity and in the adjacent villages of Quarter, Glassford and Strathaven, in which many of the passengers had friends, great consternation and anxiety were excited. Crowds hurried over fields and along stony permanent way to the scene. Huge bonfires fed by the wreckage shed a ruddy glow, despite the dismal character of the evening and the surroundings and by their light the terrible havoc wrought by the accident was dimly visible. Splintered wood, all that remained of the framework of two large carriages, was strewn all over the cutting, a carriage roof almost entire lay upside down across the rails and above it was half of a bogey with wheels uppermost. The Rev. Mr. Blair, while altogether silent regarding his own service, states that perhaps more than anyone else he is better able to speak of the great kindness and skill shown by Mr. Munro and the Quarter men, by the railway inspectors, by the doctors and by Mr. and Mrs. Thomson at the Station House. He desires that the self-sacrificing labours of those persons should be emphatically recorded. It was also reported and almost too humiliating to record the disgraceful fact that one, at least, of the victims of the disaster was actually robbed by some miscreant of all moneys and valuables, but the dastardly deed nevertheless occurred and although the police made an apprehension in connection with the affair, they have unfortunately not been successful in obtaining sufficient evidence to warrant a prosecution. Saturday last will long be remembered by the present generation of the residents of Quarter. Even the oldest inhabitants could not recall an event in connection with the village which raised so much enthusiasm, so much unanimity of purpose, every householder having done his or her best to make the occasion a memorable one. It is quite safe to say that never in all its history has the village been adorned with so fair a garland. Flowers and evergreens were used with lavish abundance. The main street was flanked with floral designs of varying form and beauty. Hardly a single house was to be destitute of some token of welcome to the popular superiors of the village, who by their generous gift of a large and beautiful edifice, have further endeared themselves to the community in which they have always taken a deep and practical interest. Moreover, the new institute which the Duke and Duchess of Hamilton formally opened on Saturday will stand as a lasting memorial of their helpfulness and munificence and a permanent testimonial to one whose goodness and kindness of heart adorn the annals of the House of Hamilton. From the Stothers's Notes of 1910. 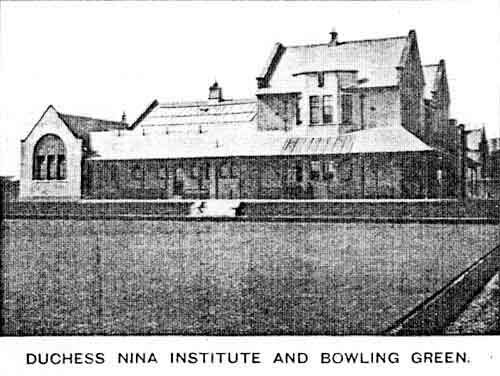 The Duchess Nina Institute and Bowling Green, adjoining, were gifted to the villagers by their Graces the Duke and Duchess of Hamilton and were formally opened on the 24th September 1910. The Institute is a handsome and most compact building and has proved a great success, from the number of people who take advantage of the reading room and the healthy, up-to-date games that are provided inside. It is managed by a committee. The Bowling Green is one of the finest in Scotland. Visitors who are interested in the progress of such institutions are made most welcome, and every information is afforded them by those in charge. After a stormy career when the Institute was used as a store by an electrical retailer and then was left derelict for a time. 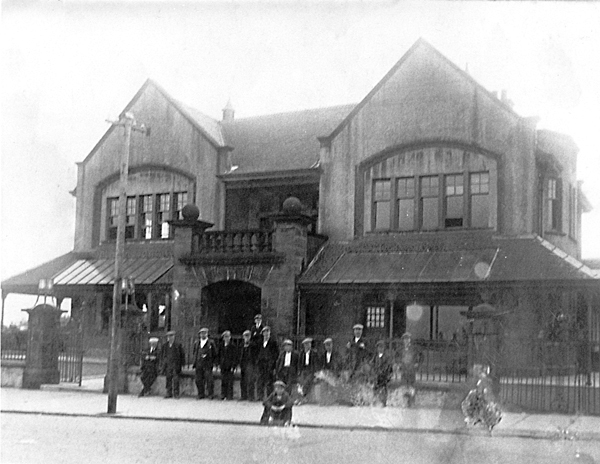 The council eventually sold the institute to the present owners to be used as a nursing home. 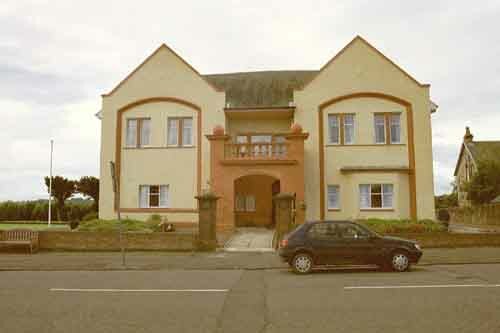 The Duchess Nina Nursing Home was opened by Mr Thomas Fleming, the Provost of Quarter and the Provost of Hamilton in 1985.